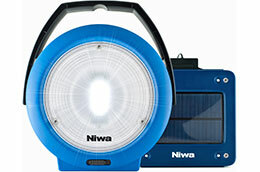 Niwa – Next Energy Products Ltd has released their third portable solar LED product. The Niwa Multi 100 Plus is a bright, portable light that offers three brightness settings. The product can easily stand on its own or be carried by a comfortable and durable handle. Like all of Niwa’s portable products, the Multi 100 Plus comes with a two-year warranty. After a full day of charging in the sun, the product can run for over 3 hours on its highest brightness setting, and on its lowest setting, it can run for 16 hours. All three of Niwa’s portable solar products, the Niwa Multi 300 XL, the Niwa Uno 50, and now the Niwa Multi 100 Plus, have passed the Lighting Global Quality Standards for modern off-grid lighting products.